The trot up is scheduled for 3pm so there are people with clipboards running in every direction, ticking off the last of the jobs to be finished! The atmosphere is great and everyone’s looking forward to getting started, after so many months of preparation. The Dressage Challenge at Castlemartyr Resort was a great success yesterday. On behalf of the Jack and Jill Foundation, we would like to thank those who attended the charity lunch, to raise funds for this wonderful charity. The food was lovely too! After lunch, the spectators sat beside the dressage arena (thank you rain, for staying away) to watch the challenge. Our lovely judge was Jane Holderness-Roddam, who has two Badminton titles and an Olympic gold medal. The riders certainly wanted to impress and produced some lovely tests and one bunny hop! 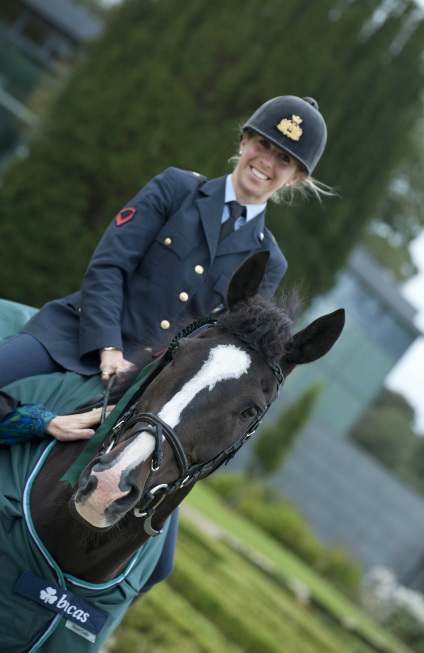 Victory and the €1,000 prize money went to Vittoria Panizzon of Italy on a score of 69.63%, with Ireland’s Sarah Ennis hot on her heels on 68.89%. Congratulations Vittoria – don’t spend it all at once!